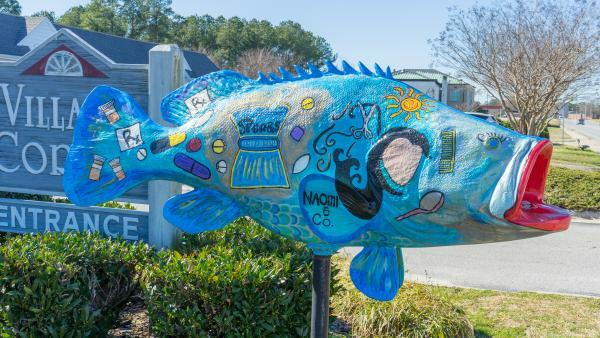 Don’t miss one of the most colorful and imaginative fish on the Roanoke Valley Rocks Tour! Spears Pharmacy began serving the Roanoke Valley in April 1982, on Roanoke Avenue. They moved to Becker Drive in 1992. Under the leadership of Larry Spears, Pharmacist/Owner, the original employees still greet customers. Spears Pharmacy is a small independent drug store that has survived the big box stores and they plan to stay. Larry is proud of the fact they offer delivery service to area homes and businesses and the same insurance copays as everyone else. The Spears Pharmacy difference is a personal experience for each customer. Naomi & Co. Hair Salon opened in 1992 and serves the Roanoke Valley and surrounding area with family hair care and tanning services. Always al the ’culling edge’ of current styles and trends, Naomi & Co. is your one stop shop to brighten up your spring look!